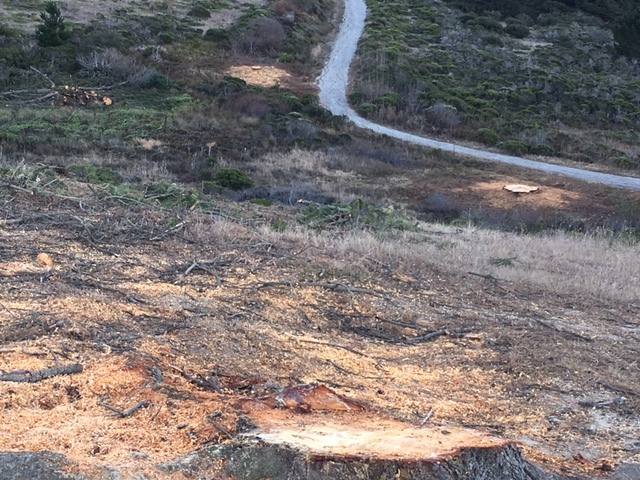 Recently, we announced the news that a public walk had been planned for Oct 30, 2017 to discuss the sudden and deplorable destruction of trees at Montara’s Rancho Corral de Tierra. 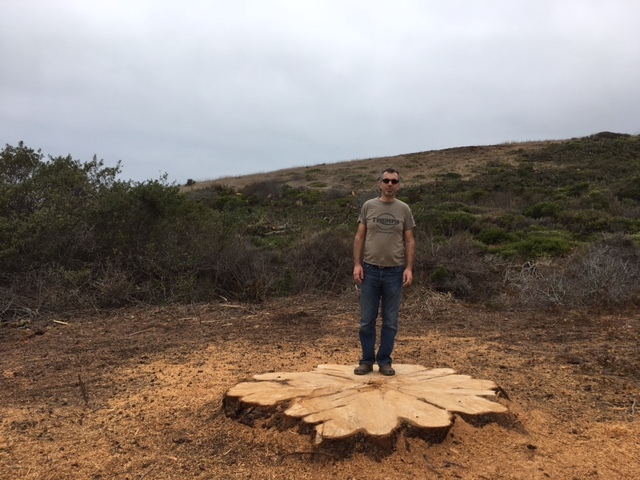 (We reported on that here: National Park Trees meet Chainsaws in Montara.) However, when supporters tried to sign up, they found the walk had filled up within days, maybe hours, of the announcement. Fortunately, one person did manage to go, and has sent us this report. Emotions ran high during a Monday mid-afternoon public hike led by a large contingent of National Park Service officials to quell community uproar over the sudden removal of healthy Monterey cypress and pines along popular trails at Rancho Corral de Tierra. 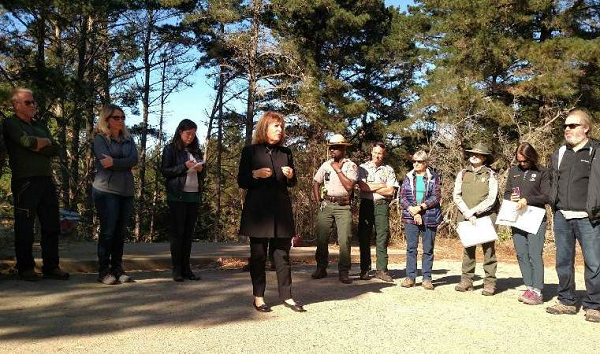 Congresswoman Jackie Speier kicked off the trailhead gathering of 30 or so nearby Montara and Moss Beach residents with sharp criticism of the Park Service’s “woefully failed” communications effort about its grasslands restoration program. While the Park Service conceded it could have done a better job of communicating plans, they offered tortured answers to critical questions about the project. Officials said it would be too difficult to identify the trees to be felled because markings could not be placed so they are visible at every angle from various directions people walk. They said the herbicide spraying schedule is unpredictable due to weather and, therefore, does not allow for advance notification or signs but that trails are closed off by staff standing guard during the spraying. The Park Service said it contracts with outside crews for tree-cutting that must be completed under a $200,000 grant that only funds the project for three years. It’s not clear whether the Park Service conducted an environmental analysis despite claiming they are required by the U.S. Fish & Wildlife Service to protect the potentilla at Rancho under the Endangered Species Act. If that is their rationale they are as matter of law required to conduct a public process before making significant changes that affect the landscape and recreation. Congresswoman Speier announced she would hold a joint town hall with the GGNRA deputy superintendent to seek resolutions working together with the community. The town hall will be November 12 in Montara in the evening. It’s important that folks try to attend because the Park Service has only agreed to stop killing trees until that meeting takes place. We’ll post more information when the meeting time and location are set. Stay tuned. The distribution map of that plant is interesting. It occurs primarily in Monterey County. The small population in San Mateo County is far north of the biggest population. Instead of complaining about water under the bridge, i.e., they already removed our most beloved trees. Let’s instead talk about replanting new trees in their stead. I am willing to pinch in some $$$ to replace these trees. Anyone else? Also, who is responsible for determining the best way to ensure the success of the Hickman’s potentilla? I would really like to see the science published for all eyes to see. How sad! I remember those trees! That area has changed so much in such a short time. However, now that the trees are gone, perhaps they should not be replaced. They were only there because they naturalized from trees planted in town a very long time ago. Some were street trees. Others were planted in the park south of Elm Street. They are native a few miles down the coast, but were not naturally endemic to Montara during modern history. Some will undoubtedly self sow like they have since the Victorian period; but if restoration is the priority, then replacement of the trees might not be appropriate.